Mark Begich: Accepts contributions from abortion-rights group NARAL. Sarah Palin: If Roe v. Wade got overturned, let people decide what�s next. Sarah Palin: Opposes use of public funds for abortions. Sarah Palin: Pro-contraception, pro-woman, pro-life. Tony Knowles: Abortion is �absolutely� a privacy issue. Sarah Palin: Coordinate state tourism marketing but no additional funding. Tony Knowles: Double funding for state tourism marketing to $10 million. Sarah Palin: Ok to deny benefits to homosexual couples. Tony Knowles: Don�t deny healthcare benefits to homosexual couples. Tony Knowles: Force Exxon Mobil to pay punitive damages to Alaskans. Mike Dunleavy: Repeal SB-91: crime is out of control. Bill Walker: SB-91: reduce prison population by 20%. Charlie Huggins: Voted NO on SB-91 (don't reduce prison population). Sarah Palin: Death penalty for adults who murder children. Sarah Palin: Questions cruise ship gambling, under casino gambling ban. Sarah Palin: Opposes legalizing marijuana, but meth is greater threat. Sarah Palin: Smoked marijuana when it was legal under Alaska law. Tony Knowles: Right to privacy protects marijuana protection. Sarah Palin: Support charters & home schools; not private school vouchers. Sarah Palin: Firm start date as part of gasline incentive offer. Sarah Palin: Opposes natural gas reserves tax--it�s not earned income yet. Sarah Palin: Analyze potential costs associated with climate change. Lisa Murkowski: Support fiscal incentives for the natural gas pipeline. Mead Treadwell: End sweeping lockups thru "wild land" & "roadless" rules. Sarah Palin: Supports �Roads to Resources�: subsidized access to mines. Tony Knowles: Strongly opposes Pebble mine as an unacceptable risk. Tony Knowles: Opposes �Roads to Resources�: no subsidized access to mines. Sarah Palin: Don�t duplicate effort in monitoring cruise ship emissions. Sarah Palin: Don�t amend AK constitution for rural subsistence fishing. Tony Knowles: Amend AK constitution to cement rural subsistence fishing. Sarah Palin: Supports state funding for Gravina Island bridge. Sarah Palin: Immigrants want more vocational training & senior assistance. Sarah Palin: Praised the Red Dog zinc mine for bringing rural jobs. Sarah Palin: Department of Fish and Game is under-funded. Tony Knowles: Urges �crab rationalization repair� to restore lost jobs. Sarah Palin: Endorsed by United Fishermen of Alaska (commercial group). Lisa Murkowski: Didn�t check before sending thousands of campaign e-mails. Tony Knowles: Didn�t make nepotism an issue in this campaign. Sarah Palin: Mitigate impact of new $50M annual cruise ship tourism tax. Tony Knowles: Supports new $50M annual cruise ship tourism tax. Sarah Palin: No income tax; no taking the people�s dividends. Sarah Palin: Would support a seasonal sales tax, but no income tax. Sarah Palin: I support President Bush�s efforts to stop terrorism. Tony Knowles: We are bogged down as an occupying army in Iraq. Sarah Palin: Funding for faith-based initiatives is adequate today. 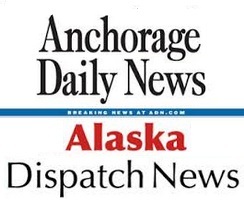 The above quotations are from Media coverage of AK political races in The Anchorage Daily News.